AERODEFENDER Wheel Fairings slice through headwinds, pulling far ahead at bottom of one kilometer hill, yielding a 6 second advantage. Summary demonstration Video: Typical side-by-side Triathlon bike downhill coasting test yields 7 second advantage in a single kilometer. Be one of the first to slice through headwinds using our revolutionary AERODEFENDER Wheel Fairings. When cycling against even a modest ground headwind, you will immediately notice that you are simply faster. Will you consider our campaign? Check out our video gallery of downhill coasting tests before you decide! Are you a road bike cycling enthusiast? Do you enjoy struggling against punishing headwinds? If so, then read no further! Enjoy your pain while fanning the wind with exposed upper wheels inducing extra drag. Others may be glad to know that cycling noticeably faster against headwinds is now actually possible! Incredibly, minimally shielding ONLY the upper wheel is the trick! Why not enjoy Optimal Aero efficiency, and gain 10-20% in speed against headwinds? AERODEFENDER Wheel Fairings nearly eliminate drag on the most sensitive drag-inducing surfaces on a bicycle: on the very fast, forward-moving upper wheel. Minimally shielding ONLY the uppermost wheel surfaces makes bicycles not only dramatically faster against headwinds, but also much safer, through increased steering control gained at higher speeds. And since AERODEFENDER effectiveness only increases still further with rising headwind speeds, the faster you go the more increased speed and stability you enjoy! This amazing drag-reduction effect from minimally shielding ONLY the faster upper wheel — as taught by our new patent — has been unappreciated until now. And so now you also know...that this surprisingly simple solution is the Future of Aero in cycling. But industry resistance is likely, since this new invention upsets decades of misleading marketing efforts to sell far less effective aero wheels. So we need your support in order to inspire change, as retailers now rely heavily on selling expensive aero wheels in order to maintain their slim profit margins. AERODEFENDER Wheel Fairings slice through headwinds, pulling far ahead at the bottom of the hill. Professional cyclists will appreciate that the breakthrough performance of AERODEFENDER Wheel Fairings — as well-documented in our numerous video downhill coasting tests in the gallery — goes well beyond any aerodynamic gains typically attained through either aero wheel optimization or conventional frame geometry streamlining. First shown at the start of Race Across America, June 16, 2018, Oceanside, CA. 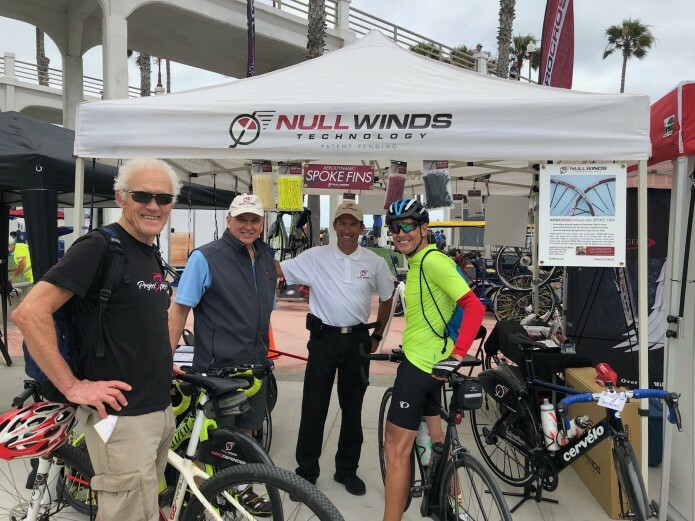 Our first AERODEFENDER customer (right), Wayne Stetina, Vice President, Road Products Specialist, Shimano America Corp., 2-time Olympic cyclist and 5-time National Road Race Champion, placing his order. Shielding the critical drag-inducing upper wheel from external headwinds is far more effective in minimizing overall vehicle drag than any other aero enhancement for bicycles. Without this critical windshielding, cyclists are needlessly fanning directly against impinging headwinds with the very fast, forward-moving upper wheel surfaces. It is against punishing headwinds where cyclists spend the most time struggling, since in tailwinds you arrive quickly. And it also against headwinds where cycling becomes the hardest, since overall vehicle drag quickly increases — becoming even more heavily concentrated on the upper wheel in rising headwinds. Why not simply eliminate magnified upper wheel drag by using a small upper wheel fairing? Underneath the fairing winds are nearly calm, like inside your car. So wind-speeds on the upper wheel are minimized, as well as drag. At higher wind speeds, drag quickly becomes the dominate factor limiting performance. Many will be naturally skeptical—in light of decades of misleading industry marketing tactics...so check out our many test videos above! The outstanding performance gains documented in our downhill coasting tests are quite clear. Or maybe read what Keith Devlin, 'The Math Guy' on National Public Radio from Stanford University, has to say about the technology: "With so much research put into the problem of headwind drag, you would think the industry had done as much as could be done. But as Magee showed, there were still more efficiencies to be obtained. His observation is an excellent illustration of the power of mathematical thinking. ...All in all, it’s a superb example of 21st century mathematical problem solving." Null Winds Technology is introducing revolutionary drag-reduction technology to the bicycle world. Shielding the faster-moving upper wheel surfaces from headwinds yields dramatic increases in speed without sacrificing crosswind stability. Surprisingly simple, and surprisingly effective, Upper Wheel Fairings actually dramatically increase propulsive efficiency with rising ground headwind speeds. Upper Wheel Fairings shield critical drag-inducing surfaces on a bicycle from headwinds, significantly boosting performance. With our Upper Wheel Fairings installed, cyclists report dramatic gains in speed while penetrating headwinds. One can readily feel the difference, as headwinds really slow a bicycle having exposed upper wheel surfaces. Depending on headwind conditions, riders have achieved speed gains ranging between three and 20 percent. And the relative gains only tend to increase in rising headwinds, especially ground headwinds. Unshielded upper wheel surfaces needlessly augment critical drag on wheeled vehicles. In fact, most vehicles with unshielded upper wheels are needlessly aerodynamically handicapped. With their exposed upper wheel surfaces, cyclists are simply fanning the wind, needlessly. Our Upper Wheel Fairings restore a bicycle to a more optimal, minimum-drag configuration. While wheel fairings generally are not allowed under traditional race rules, the recreational or commuting cyclist need not adhere to the drag-inducing restrictions of the race community. The cycling public should enjoy the inherent drag-reduction that comes from shielding upper wheels from headwinds. Stop fanning the wind. Test our Upper Wheel Fairings for yourself, and you will never again want to ride without them in windy conditions. Cycle smarter with Null Winds Technology. Upper Wheel Fairings shield the most sensitive drag-inducing surfaces on a wheeled vehicle from headwinds, thereby dramatically reducing the power needed for propulsion. Surprisingly simple, and surprisingly effective, Upper Wheel Fairings cause propulsive efficiency to increase with either rising vehicle or headwind speeds. Designed by an engineer from the aerospace industry, Upper Wheel Fairings are likely to alter the preferred configuration of the non-competitive road and gravel bicycles. While simple in design, this approach to shielding only the critical uppermost wheel surfaces is highly effective. Common engineering models for drag forces on wheeled vehicles fail to account for the dramatic benefit provided by this critical shielding. Consequently, a patent has been granted for this innovation. And as a side benefit, Upper Wheel Fairings actually enhance tire traction. 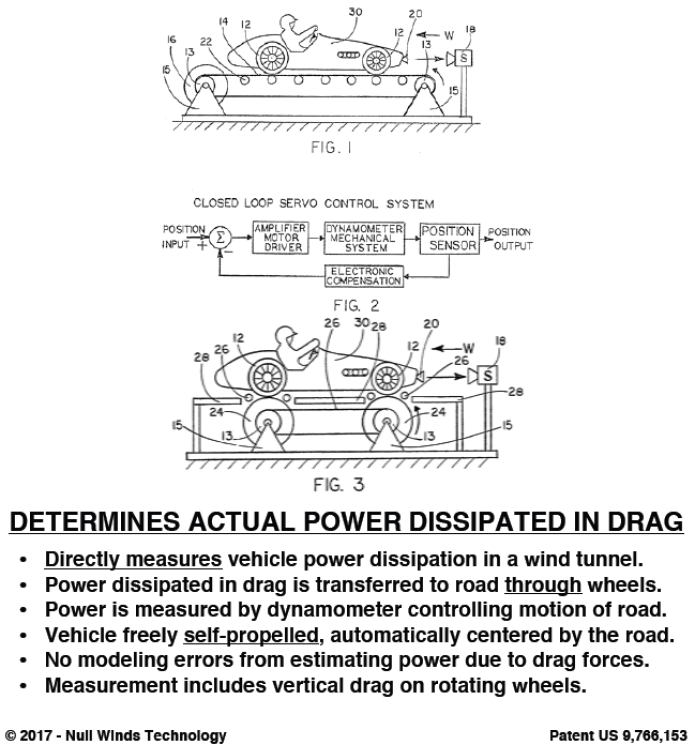 This unexpected effect is readily explained using the proper mechanical model for drag on wheeled vehicles, a subject of the patent. Cyclists also report no increase in crosswind susceptibility, a consequence of the enhanced traction. Thus, cyclists can expect to ride both faster and safer using our Upper Wheel Fairings. The CEO of 'Gran Fondo World Tours' happened by while early testing in March 2018, and became our first independent pro witness. See the video in our gallery for his reaction. Side-by-side testing while simply coasting downhill eliminates most variables, yielding a more accurate comparison. Two tests are conducted, with riders switching bikes for an average comparison. The basic idea taught by the invention is that only the upper wheel should be shielded from headwinds, since the bottom of the wheel is actually stationary, at least momentarily. Thus, there is almost no drag at the bottom of the wheel. Placing a fairing in front of lower wheel surfaces—that is itself moving much faster than the lower wheel surface that it is shielding—is actually counterproductive, as the faster-moving fairing produces more vehicle drag than the much slower-moving lower wheel surface. Since the top of the wheel is actually exposed to more extreme wind speeds—moving forward at up to twice the vehicle speed, plus any additional external (ground) headwind speed—greatly exacerbates the drag dissipated thereon. And since drag dissipation is actually a highly-sensitive cubic function of wind speed, this makes the much smaller—but much faster-moving—upper wheel surfaces dissipate even more power than the much larger—but much slower-moving—wheel fairing surfaces that are used to shield the upper wheel from headwinds. Shielding Nearly Eliminates Critical Upper Wheel Drag on Open-Wheeled Vehicles. In fact—as taught by the invention—for any given vehicle operating condition, there exists an optimally sized configuration of the upper wheel fairing that actually minimizes overall vehicle drag; any smaller fairing size shielding the upper wheel actually increases overall vehicle drag away from this optimal minimized drag condition, while any larger fairing size also increases vehicle drag away from this optimally minimized vehicle drag condition. The trick then is to configure the wheel fairing neither too small nor too large in size to actually minimize overall vehicle drag under the normal range of headwind and vehicle speed operating conditions. 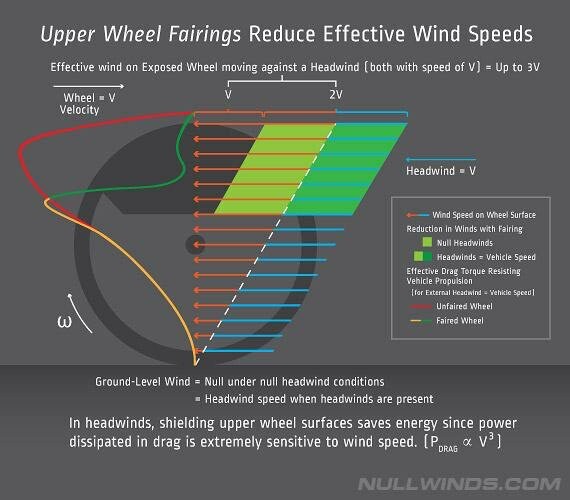 This is why optimally sized AERODEFENDER Wheel Fairings work so amazingly well, especially under headwind conditions. The proper mechanical math model for drag on open-wheeled vehicles is actually quite complex—having more than a dozen terms—but predicts the vehicle drag coefficient to be actually variable (rather than being a constant, as commonly assumed). This variability in open-wheeled vehicle drag coefficient is quite evident in the first downhill side-by-side test video using gravel bikes, where the unfaired stock bike is shown varying in aero efficiency—gaining or losing ground on the faired bike—depending on the relative strength of the headwind. In this very first downhill coast test (see the following video), the smaller aero rider carried extra weight in an effort to more closely balance aero effects with the larger rider. However, the extra weight proved to be not needed, as his smaller size made him even more aero than the heavier rider. 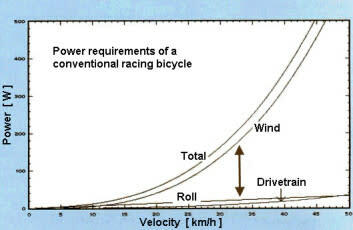 But that particular test configuration happened to provide a very closely-matched aero condition in the second ride (when the riders switched bikes), where it clearly showed the variability of the vehicle drag coefficient that is predicted by the proper vehicle drag mechanical model; overall vehicle drag being highly dependent on the immediate headwind condition. This headwind-dependent variable drag-coefficient effect is noted in the video. Notice how the stock bike gains a bit on the fendered bike when the external headwind diminishes, and looses ground on the fendered bike when the external headwind increases. This variation in speed is explained by the variation in the effective vehicle drag coefficient. This proves that for open-wheeled vehicles, the vehicle drag coefficient is not in fact a constant, but is instead a variable being a function of both external headwind and vehicle speed as predicted by the proper drag mechanical model. Fenders covering the upper wheel greatly reduce this variation in vehicle drag coefficient, making the vehicle drag characteristics more stable and thereby closer to that of an airplane — where all surfaces are exposed to the same wind speed. 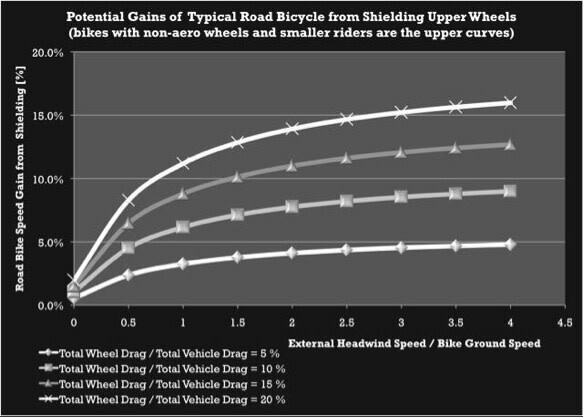 Mechanical Model shows Smaller Cyclists to Benefit Most (upper curves). Note that aero efficiency is minimal under null conditions (left axis), but quickly rises against headwinds. Moreover, the proper mechanical math model predicts that as speeds (either vehicle or headwind) increase, the gains in aero efficiency for the fendered vehicle actually increase. This is why faster riders suffering greater headwinds stand to gain the most benefit penetrating headwinds with AERODEFENDER Wheel Fairings installed. And the videos above clearly demonstrate this effect, as the fendered bike increasingly pulls away further ahead as the headwind increases around the steepest portion near the bottom of the hill. Further confirmation is found through early road testing of side plate fairings in very strong headwinds, where a more than 20 percent gain in speed was recorded on a road bike simply from shielding the uppermost spoke surfaces alone: See test report. While the videos show dramatic gains in aerodynamic efficiency are achieved while simply coasting downhill into a moderate headwind, adding more power to the system by pedaling further increases the aerodynamic gains that AERODEFENDER Wheel Fairings provide at higher speeds. And smaller, stronger riders facing stronger headwinds benefit the most! Some may still wonder why this configuration had not been considered previously. We certainly did! The only explanation that we could come up with is that the continued prevalence of the bicycle industry for testing inside wind tunnels—where vehicles are mounted on pedestals to measure translational drag forces as if they were airplanes—has contributed to limited understanding of the actual drag mechanics of open-wheeled vehicles. When we considered wind tunnel verification for our invention, it quickly became evident that current industry testing protocols would not produce the actual gains in efficiency that we were finding in real-world road testing under external headwind conditions. This insight resulted in our newly patented method for more accurately measuring vehicle efficiency within a wind tunnel: Patent US 9,766,153. This new method measures power being delivered through the wheels to the rolling road itself, while the vehicle is self-propelled and unrestrained—equivalent to a real-world road condition—which is then equivalent to the actual power being dissipated in drag on the vehicle. With current wind tunnel testing protocols generally aimed at testing under equivalent null external wind conditions such as used for airplanes, industry tends not to test wheeled vehicles for performance under rising external wind conditions. This testing preference is likely due to the faulty assumption that the vehicle drag coefficient is invariant with headwind conditions, as it is for airplanes. As proven in our test videos, for open-wheeled vehicles the effective vehicle drag coefficient instead varies substantially with external headwind conditions, as well as with vehicle speed. Please note that AERODEFENDER Wheel Fairings do not make bicycles dramatically faster under all operating conditions. 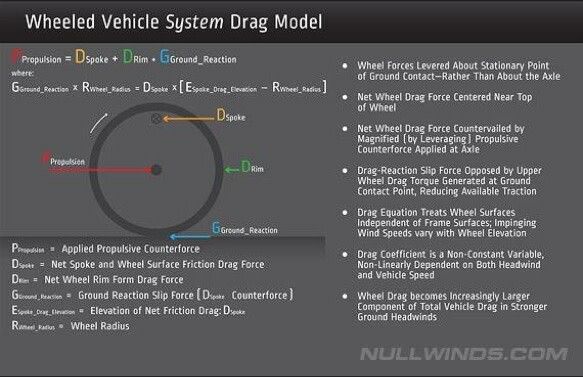 In fact, shielding the upper wheel is only minimally effective under null wind conditions at lower speeds. But it quickly becomes dramatically effective as headwinds increase (due to the cubic sensitivity of power dissipation with rising windspeed), or typically much above 15-20 mph in null winds. That is, becoming most effective when facing external headwinds, or at higher vehicle speeds—the very times when you really need it! Earlier industry efforts have often shielded much more of the wheel extending well below the level of the axle, which further limits wheel fairing effectiveness. For these reasons, the minimal upper wheel fairing of the invention has remained unappreciated. Thus, previous wind tunnel testing would not have demonstrated the dramatic effectiveness of minimally shielding only the uppermost wheel under external headwind conditions. And with AERODEFENDER Wheel Fairings installed, wheel aerodynamic efficiency becomes only a secondary consideration. As explained above, most all the power dissipated on a wheel occurs near the top. The shielding provided by our fairings largely negates any additional advantage provided by aero wheels. Thus one can easily substitute inexpensive alloy training wheels in combination with our AERODEFENDER Wheel Fairings and still outperform more expensive aero wheels. And the fairings make wider tires even more aero. Finally, if this has not provided enough confusion, then further explanation can be found within the issued patent US 9,878,745, "UPPER WHEEL FAIRING REDUCING CRITICAL VEHICLE DRAG." Or maybe an easier start may be found by examining our summary drag reduction flyer, which helps explain the implications of using our AERODEFENDER Wheel Fairings on open-wheeled vehicles. Thanks again for your interest! For a few more AERODEFENDER insights, some questions answered.